I sought to address the concept of Australian identity as an introduced species and the way we have used native surrounds and our environment to meet European needs. I wanted to depict the introduction of animals, like the rabbit and the fox, that were initially brought across to meet the Early Settlers desire to hunt, that then breed to epidemic proportions in our native environment. It is also meant to celebrate the difference of the Australian environment, and to find beauty in its difference. 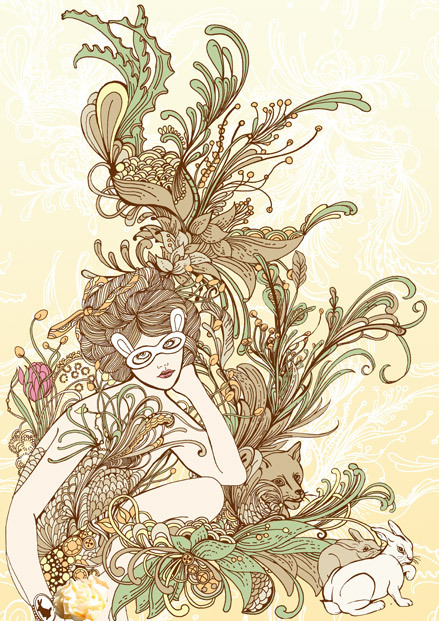 Eugenia Tsimiklis is an illustrator and textile designer from Adelaide, South Australia. She graduated with a Bachelor of Visual Communications in 2001 from the University of South Australia and moved to London. She worked as a fashion textile designer in studios in East London for five years and freelanced as an illustrator. In 2006 she moved back to Australia, relocated to Melbourne, where she illustrates and creates prints for the fashion industry. In her spare time, she loves to draw animals, flowers and all things nostalgic and is inspired by vintage prints, dresses and old story books, art nouveau graphics, coloured glassware and animal figurines.